We’ve gotten numerous emails and phone calls from OspreyWatch volunteers concerned about ospreys in the nests they are monitoring. 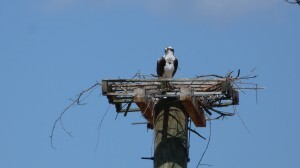 Ospreys nest on many different types of man made structures including buildings, cellular towers, boats, utility poles, and channel markers. 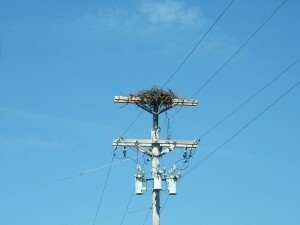 Nests on utility poles can pose a significant risk to the adult and juvenile osprey. Fire Hazard. Nest material may ignite from contact with energized wires. Nestling ospreys would be at risk. Electrocution. Osprey can touch parts of the energized structure with their body (wings, feet, bill) including when the excrete waste. Juveniles are especially susceptible as they begin to fledge the nest. Nest management can include trimming nest material, providing alternate nest platforms, or removing nests. 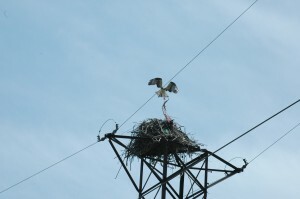 Many utility companies participate in the Avian Power Line Interaction Committee (APLIC) and follow their guidelines on managing bird nests on power poles. If you have a nest you’re concerned about, contact your local electric utility and ask to speak to their environmental staff. Reference the APLIC document Suggested Practices for Avian Protection on Power Lines: The State of the Art in 2006. Utilities are interested in minimizing electric outages from bird electrocutions and should respond positively to your request. 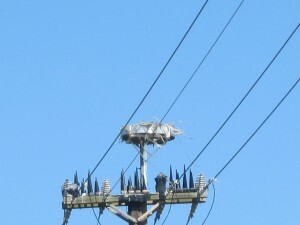 This nest was elevated above the energized equipment and the transformer busing covers were covered up. OspreyWatch nest 750. This pole was retrofitted with perch deterrents, covered energized equipment, and an elevated nest platform. OspreyWatch nest 747. Trash used as nest material at this nest in Norfolk, VA could pose a fire hazard to nestlings. Nest material can pose a fire hazard when it makes contact with energized equipment. OspreyWatch nest 382. Adult osprey beginning a new nest on an alternate nest platform. OspreyWatch nest 492. In the US, Osprey are protected by the Migratory Bird Treaty Act (MBTA). A MBTA permit can be requested from your regional US Fish and Wildlife Service field office. In some instances a nest may be relocated to a nearby structure. State laws vary so check with you local state wildlife agency before moving a nest especially if the nest is active (eggs or young). 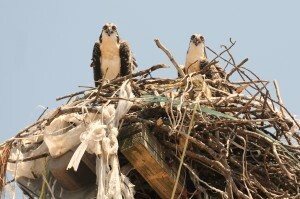 Moving an osprey nest without prior approval may violate federal and state laws and result in fines or criminal charges. When moving an empty nest, relocate the nest within 100m of the original nest location. Use zip ties to attach nest material to the new support structure. After moving the nest, the original nest site should be modified or actively managed to discourage the osprey from rebuilding. This can be reconfiguring power pole equipment or daily visits to a boat or other structure to remove newly placed sticks. 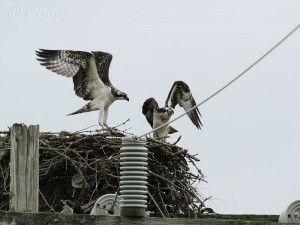 The osprey should quickly key into the new nest structure. Osprey will grab manmade objects floating in the water including trash, nets, and fishing monofilament. These objects can become hazardous to the adults and young. 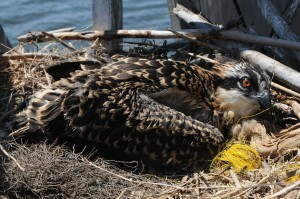 If you suspect an osprey has become entangled, contact your state or provincial wildlife agency office for assistance. 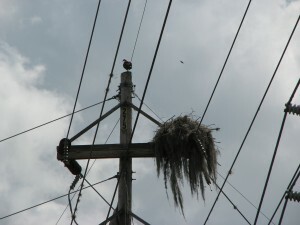 Adult osprey tangled in line attached to a nest on a transmission line. 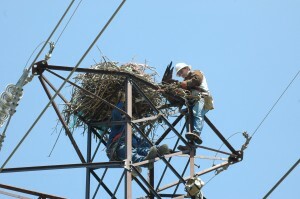 Dominion Power linemen rescued the osprey by cutting the monofilament (2009, Virginia). Nestling tangled in netting brought to the nest by its parents. 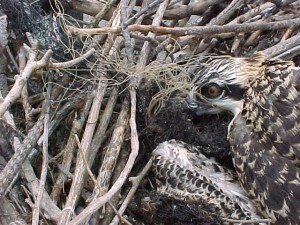 Osprey nestling entangled with netting.